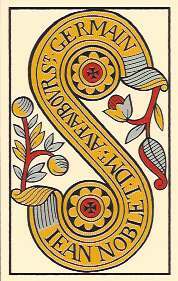 On this page we’ll go beyond the cards themselves to enrich their meanings with other symbol systems. Each of the four suits has been associated with just about every element at one time or another. I find most suits are a blend of more than one element and it’s a personal choice how you assign them. For instance, Coins are made of a solid substance like earth but they circulate like air. Cups are usually associated with water because they can hold a liquid, but the cups themselves are solid containers. Swords are used for stabbing and slicing, which associates them with fiery courage and aggression; but fencing requires finesse and strategy which seem airy. 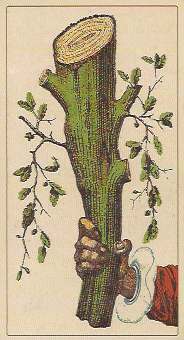 The Rods are often depicted as earthy tree branches, but they could also represent the fiery life force. When assigning elements to the suits you need to consider the court cards. Often the court figures and the pip symbols seem to carry very different elemental energies. Most contemporary authors use the popular Golden Dawn system: Coins = Earth, Cups = Water, Swords = Air, Rods = Fire. This system is as good as any, and is the default that most people are comfortable with. But you are certainly free to make your own attributions. Before using someone else’s number system, try figuring out what the numbers signify in the context of your deck. Lay out the same numbered card from each suit and get a feel for the basic energy quality they all have in common. Cups and Coins have a similar pattern as do Rods and Swords. Look at these pairs separately, and then try to find something that both pairs have in common. For example, what’s going on in the Two’s? Are the two suit symbols magnetically attracted to each other? Clashing? Separated? Repulsed? Each suit is probably different. What’s the common thread running through all the Two’s – relationship? Interaction? Attraction? Try to come up with at least three adjectives for each number before looking at someone else’s system. Here’s a brief list of common meanings for the numbers. 10 After completion. Distilling all the numbers to create the seed of a new cycle. Brainstorming exercise: Get ten index cards and put keywords for each number on a card, then get out the four index cards with your meanings for each suit from a previous exercise. Mix and match your meanings for the suits and the numbers to come up with keywords for each card. 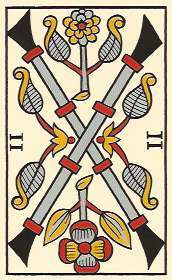 For instance, if four means stability, Four of Cups might mean “stable relationship”, while Four of Rods might mean “stable employment”. Always refer back to the image on the card. Can you see your meaning in the illustration? The visual comes first; otherwise you’re assigning arbitrary meanings that have to be memorized. Look at how color is used in your deck. Does any suit have a predominant color that seems to define it? Is any color absent in a suit? How is color used on the flowers or other decoration? Do the rods have a different color in the center where they cross? Are the upright swords the same color on all odd-numbered cards? What color is in the center of the coins? In most decks the cups are gold with a red interior. What does this say about the suit’s meaning? Here is color symbolism gathered from several French authors who use the Tarot de Marseille. Yellow: Intelligence, spirit, intuition, higher mind, will (gold is a higher, more spiritual version of yellow). 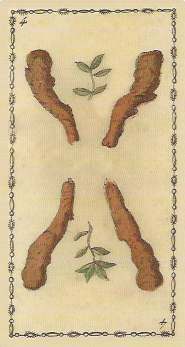 In this popular French method, the pip cards derive some of their meanings from the trump card with the same number. 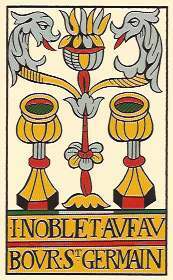 For instance, the Four of Cups shows Emperor energy influencing ones emotional life. 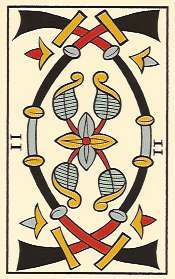 The Four of Coins is Emperor energy working through finances or business dealings. This method assumes there is something essentially “fourish” about an emperor, and there’s something “sixish” about Lovers, which is why they have that numerical position in the trump sequence. This may be a stretch, since the early decks didn’t have numbers on the trump cards and many trump cards were in different positions, depending on local custom. 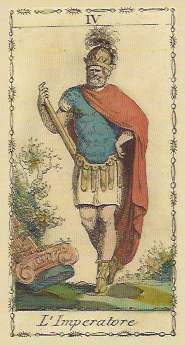 But this technique seems to work with trumps I through X of the Tarot de Marseilles. Exercise: Line up all the Aces under the Magician and tell a story about how the Magician manifests through each pip card. Put all the Twos under the Papesse and do the same. Repeat until you get to the Tens. On the next page we’ll move on to reading the court cards.